I suppose there are two ways to learning something new - one way is covering a linear set of topics regardless of your personal interest or inclination just to cover the subject completely to achieve an end result. The other way is trying, experimenting and in the process gaining insight into the subject matter. The LDC system together with Will as an instructor allows you to learn the latter way. Every lesson was tailored to my specific need. 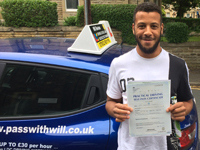 I found that Will is not teaching you just to pass a 40 minute test, although he does that very well (I passed first time), he is in fact teaching you to drive on your own with paramount regard for your own safety and safety of others under circumstances you would face daily as a driver. We did night time driving, driving on hills, driving on narrow county roads, dual carriageways, town centre driving, different roundabouts and much more, all this time Will emphasised independent thinking and decision making while always kee ping you safe on the road. We would often have long discussions on various types of roundabouts, how to deal with oncoming traffic on narrow roads, how a clutch works to facilitate gear shifts, how not to inconvenience your fellow drivers amongst various other topics. One advice to anyone learning to drive- do not worry too much about number of hours, lessons and start comparing to others. Driving is a skill that can take some time to master.I’d say enjoy the learning process, enjoy driving and it’s intricacies. That would be a much more fulfilling experience. Thanks Will for helping me pass my test with such ease recommend your services to any one was great having you as my instructor made driving seem easy thanks again. I was fortunate to be trained by you. You are a very good instructor with lots of calm and made me feel safety and relaxed when i was driving, Thank you so much for guide me in good direction. I highly recommend Will as a driving instructor, he was fantastic. He made me feel very comfortable from the first lesson. I am quite a nervous, high rate person but Will was always reassuring and calm even at my worst moments. Always professional and punctual & very reasonably-priced, well worth the money. Thanks for putting up with me! Will is a absolute star! I really couldn't have got a better driving instructor. He was always patient and calm no matter how many times he had to explain things. No matter how nervous I was he managed to calm me down just by not making a big deal out of the many mistakes I made and never criticising but just explained how to correct them. Learning to drive hasn't come naturally to me and there were definitely times when I was ready to say forget it. But Will kept telling me I had the ability to do it I just needed to believe that too. Really cannot thank him enough for his help, he became not just my driving instructor but a friend! Before my first lesson I was very nervous about it,Will made me feel comfortable straight away with his calm and reassuring manner through all my lessons. When I made a mistake he always explained what I had done wrong and how to easily correct it. Whilst performing manoeuvres he helped me to break them down into short simple steps which was really useful. He was very reliable and always on time. I wouldn't hesitate to recommend him to anyone and will be requesting his help again in order to gain confidence driving on the motorway. A big thank you to Will for getting me through my test, I couldn't have done it without you! As you know, it was important for me to get passed in a short space of time and you put me at ease straight away! Thanks again and I'll certainly be recommending you. A big thank you for going out your way to teach me, still can't believe I did it. Probably the most ideal instructer I could have had. I think you have been really patient with me, taken it step by step and made sure I was confident with every phase of driving we went through. I had a semi-intensive course with Will that lasted just over 6 weeks. He was a really good instructor for me, as he built my confidence up gradually and taught me how to drive rather than how to pass the test. Will was able to answer any questions that I had leading up to the test and explain the different parts of the test thoroughly. We covered a wide range of driving styles and I feel that he has taught me to be a better driver due to this. On the build up to the test we did a mock test which helped me to build my confidence up even more and allowed me to realise that the test isn't really that bad. He tested my ability by giving me clear instructions that were easy to follow. Will himself is a very calm and professional person and will not make you feel uneasy whilst driving. If you need to pass quickly learning with Will is the best decision you can make. Thanks for all your help with the driving, you are a great instructor and I recommend you to anyone wanting to learn how to drive. You helped me to achieve my goal, and helped me pass my test. You always remained calm even with me behind the wheel lol. I believe I have had an excellent teaching experience from Will. He actually taught me to drive, as opposed to just teaching me how to pass the driving test! The fact that I chose to learn over the winter period didn't mean any compromise in where we went for lessons. Will took full advantage of a cold winter in Huddersfield and the wider Pennine hills, and taught me about driving in a whole manner of different weather conditions, including very dense fog on the moors, pouring rain at night, and narrow steep single-track country lanes in snow and ice! I am thankful for the many and persisent corrections of all mistakes which were made from the beginning, eventually leading me to be able to self-analyse my own mistakes, and quickly correct them during a lesson. He had a way of getting me to think on my feet, and think about and vocally describe what I, and other drivers were doing. All of this, and the three full mock driving tests we actually did, resulted in the actual driving test being a pleasantly easy and relaxing experience....a kind of like "oh, was that it...?" Will took me way beyond what the "official driving test" required, in terms of being ready for many eventualities, road types and conditions, and weather conditions. Will's lessons and the LDC program are both highly recommended. I found that, while driving I had a lot of questions about how to approach certain situations and not the basic rules of driving. Will seemed to have the answers, and described the best ways to make the manoeuvres, crossing duel carriageways, having awareness of the traffic signs, markings and other vehicles, and driving in different weather conditions. He did this comprehensively, using the LDC guidelines and through his own experience. I came away, knowing how to drive in a confident and detailed way. If you want to learn to drive properly, this is a good choice. With only 2 weeks available from work for me to learn to drive I needed an intensive course that would be effective, modest and above all fun. After extensive research I picked Will's Driving School and ended up getting all 3 of these requirements. Will is an excellent driving instructor, able to explain complex manoeuvres in simple steps and endlessly patient as I struggled to turn theory into practice. In this the LD system is a real advantage as I was never going into a lesson cold or without any understanding of what I was supposed to do. 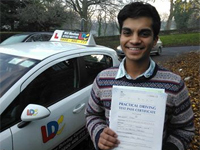 Will was also keen that I should be as confident as possible as a driver, not just able to pass the driving test. As a result I drove all types of road in all weather conditions. This had the twofold advantage of not only making me a better driver but also making the intensive sessions really fun. I couldn't recommend Will highly enough for anyone looking for an instructor. It has been a fantastic experience learning with Will. He has a calm and cool approach and made the whole learning experience very comfortable. Although it was a comfortable experience, it was also a challenging one, where I was kept on my toes. He made me aware of the mistakes I was making and helped me to correct these errors swiftly. I was given excellent reading material before my driving lessons started which helped me pass first time and I would like to thank Will for helping me achieve this. 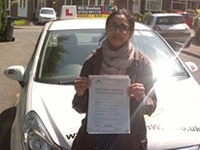 I just want to thank you for your driving lessons which helped me to pass my driving test. I was very nervous each time I did my test but you helped me to stay calm and made me believe that I could do it, I just needed to drive like I knew I could. Your training was always explained in a way that was easy to understand as I had never drove a car until I started my lessons with you. The atmosphere was always friendly which helped me to relax. I found driving really difficult when I first started but you helped me through it and was very patient with me. Thank you for all your help I would recommend you to others as you are a very good driving instructor. 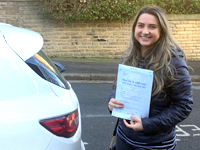 I spent many hours before my 17th birthday looking for the perfect driving instructor and the best prices, with a prolonged search my best result was http://www.passwithwill.co.uk, I then booked a booked a one week pass course with Will. First lesson I knew I would pass with ease because not only was Will an excellent instructor who is easy to get along with he provides you with extremely useful material e.g. book & DVD to improve driving skills and knowledge of which he tests you on to ensure you fully understand the driving skills. I really enjoyed the lessons, Will helped me in every way possible through all the stages and if I made a mistake, he is calm and reassures you and builds your confidence which was really helpful, with the manoeuvres Will explained and showed each and every manoeuvre in a way which is very easy to understand. I had booked my course with Will and was really pleased with the confidence he builds in you when you're driving and learning. When it comes to manoeuvres, Will is great at explaining everything so that you understand and ensures that practice makes perfect. You always feel that you can drive with Will and if you make mistakes you learn from them, and you don't feel that you can't drive or won't pass. He's a really calming influence and I know that that's what got through my test (and my ridiculous nerves). I had an intensive course over two and a half weeks and really enjoyed it. When it came to manoeuvres, Will was able to explain how to do them in a way I could understand and even show me how to do them. He gave me confidence in my abilities even when I felt I was doing badly, which I believe led me to pass my test. We spent a large proportion of my lessons doing mock tests and driving to the test centre in order to familiarise myself with the test procedure which really helped calm my nerves about the test. During my lessons, it appeared I had trouble getting to grips with roundabouts; so Will took me on them as much as possible until I was more confident about going on them. It was the same with anything else I found difficult: we kept at it until I got it. Once or twice, when I made big mistakes, Will always kept calm and knew how to get me out of the situation which was great. My name is Darryl Jones and as a learner driver with Will I am really happy at the way he has helped with me and taught me to drive. Never has he made me feel like I could not drive or be unable to pass; he has never raised his voice to me or made me upset even when I make mistakes. We stop, relax and calm down; he then explains where I went wrong and how to put it right. He treats me as a competent person who can drive and pass the test when it is time. He asks me what I already know and then explains everything I need to know, when we are about to try a maneuver, he remains calm and talks me through what is happening as we are doing the maneuver; after completion we review. I know that choosing Will to teach me to drive was the right thing to do; he has helped me greatly and got me ready for something I thought I may not. My girlfriend would like to say that she as a driver has seen me become a more confident and a better driver under the tuition of Will and she will be happy to see me pass my test. I passed my test on the 11/05 and I know that Will got me there and I was ready.